This series of articles will outline the life of Albert Balch, the developer who, beginning in 1941, built the Wedgwood houses which gave their name to the neighborhood in northeast Seattle. Balch’s father Albert S. Balch Sr. was from a Michigan farm home, and as a young man in his twenties he went to seek his fortune out West. Balch Sr. arrived in Washington Territory before statehood and first lived in the Bellingham area of Whatcom County. An anecdotal family story is that Albert Balch Sr. travelled by boat in Puget Sound from Bellingham to Seattle, because he wanted to have a look at the city and decide whether to settle there. But it was the day of Seattle’s Great Fire, June 6, 1889, and there was too much smoke drifting over the waterfront to see what the town looked like. The boat could not dock at Seattle, and Balch Sr. went back to live in Whatcom County. Because his father had come to Washington before its statehood in November 1889, Albert Balch Jr. later drew on this for his eligibility to join the Pioneer Association of Washington. But before Balch Jr. was born, in the 1890s Balch Sr. apparently decided to leave Washington Territory for a time, and go into silver mining work in Idaho. Balch Sr. married late, and he was forty years old when his son Albert Jr. was born. Albert Sidney Balch Jr. was born on March 16, 1903 in Gem, Idaho. Today Gem and Burke in Shoshone County, Idaho, are true Western ghost towns as nothing remains of them but a few buildings. Nearby Wallace, Idaho, still survives and is a historic site where the silver mining industry continues today. Silver Mill in Gem, Idaho, in the 1890s. Photo courtesy of University of Idaho Special Collections and Archives, Item number 8-X00307. Albert Balch Jr. and his brother George, younger by three years, spent their early lives in the mining community in Idaho. 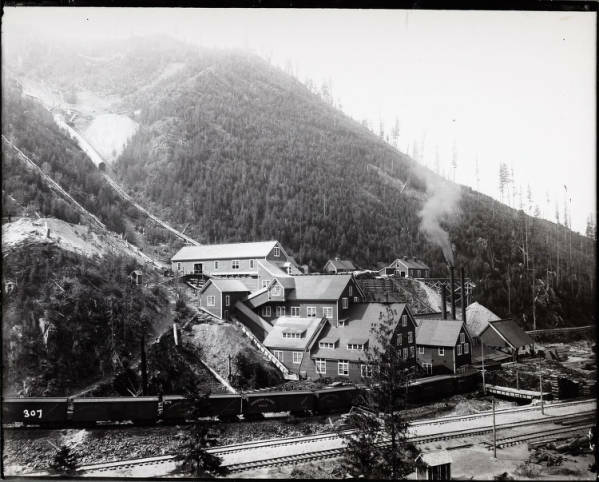 The Balch family returned to Washington State in about 1916, when Balch Sr. was fifty-four years old, so his decision to leave silver mining may have been based upon his age and decreasing ability to do the work. Another factor in the Balch family’s return to Washington State, might have been their interest in better schooling for their sons. In those days grade schools went through eighth grade, and if continuing on, a student would have to go to a high school which might be in a neighboring, larger town. It appears that the Balch family left Idaho at about the time that Albert Jr. was around age thirteen, as his biographical notes say that he completed grade school in Blaine Washington; this means that he attended eighth grade there, at least, and then he went on to a four-year high school. In Blaine, Whatcom County, Albert Balch Sr. is listed on the census of 1920 and 1930 as a storekeeper/cigar merchant. We can presume that the store was successful because Balch Sr. continued to have the store from before 1920 when the family settled in Blaine, until his death in 1932 at age 70. We know that Balch Sr. was aware of his family ancestry as he conveyed this knowledge to his eldest son, Albert Jr. In the days before genealogy records were on the computer, family stories had to be passed down verbally and in listings of generations which were often written inside the front cover of a family Bible. Before computers, researching one’s family history would involve going to look at copies of the census which were only available at archives and libraries, as well as going in-person to look at original courthouse records, cemeteries and church records. 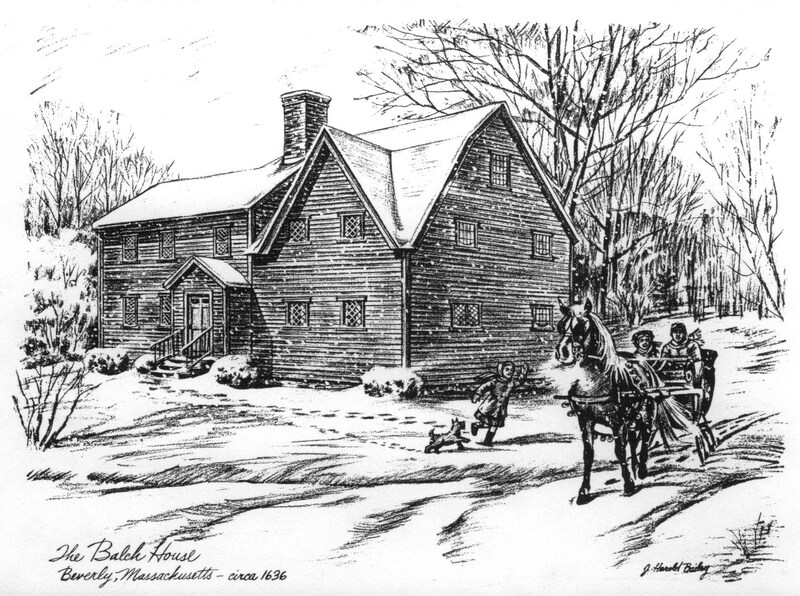 The John Balch House in Beverly, Massachusetts, is one of the oldest wood-frame houses in the USA. Two great streams of American heritage converged in Albert Balch Jr.’s life. From his father, he inherited the history of early American founders and the adventure of westward movement. Balch Jr. knew that Capt. Lafayette Balch, who came from Maine and was the founder of the town of Steilacoom in Pierce County in 1851, was his great-great-uncle. Other Balch relatives were in the lumber industry around Puget Sound in the pioneer period of the 1850s to 1880s. Through his mother, Josephine, who was from Sweden, Balch Jr. received the heritage of immigrant-American values: the drive to get an education, make something of oneself and take hold of all that America offers in freedom and opportunity. We can imagine that it might have been Josephine who kept her two sons on the straight and narrow during their growing-up years in the rough mining town in Idaho, and it may have been Josephine who insisted that the family move to where her sons could get a better education. We know that Albert Balch Jr. was a good student, because he was valedictorian of his high school graduating class in Blaine, Washington. A valedictorian award is most often given on the basis of academic excellence and it can also be given to the person who best represents their class for the senior year. The title of Albert Balch Jr.’s valedictory address was, “How to Build a City.” Considering his birth in remote Gem, Idaho, and his limited exposure to large cities up to that point in his life, the subject matter would seem to have been beyond his scope. However, we can see that Albert Balch was already developing the drive, enthusiasm and vision which would later lead to a successful real estate career in the city of Seattle. Upon graduation from high school in 1921 Balch’s first full-time job was with a newspaper in Blaine. In that era newspapers were of primary importance. All local and national news, advertising for local businesses and other kinds of community activities were publicized in newspapers. It was common even for smaller cities to have more than one newspaper, and the papers competed for interesting articles to attract more readership. Working at a newspaper would have given Balch exposure to business and political leaders and to “how things worked” in the community of Blaine. Whether he was trying to save up money or just taking time to decide what to do, Balch worked at the Blaine newspaper for a year following high school graduation. He then entered the University of Washington in Seattle in the fall of 1922. Balch had to work his way through college, and he had many different jobs, including waiting on tables in a restaurant. Balch hit his stride when he began working in sales jobs during summer breaks from the university. He had a gift for selling, beginning always with his enthusiasm for his product. His optimistic outlook was contagious and enabled him to make sales. Balch graduated from the University of Washington in 1926 and for the next two years he enjoyed the job of national travelling representative for the fraternity he had belonged to at the UW, Sigma Alpha Epsilon. As of 1928 Balch wanted to establish a career in Seattle, and he worked at several different jobs in business, communications, and sales. An economic depression hit all of the United States during the time that Balch was looking for suitable employment, 1929 to 1932. He briefly considered entering politics. In 1932 he went back to Blaine, probably to help his widowed mother, and during that time Balch ran for the Washington State Legislature from his home district in Whatcom County. Balch did not win the election, but perhaps it was just as well, as his heart was calling him back to Seattle. In July 1933 at age 30, Albert Balch married his sweetheart Edith and they settled in Seattle. In 1933 the economic freeze called the Great Depression was very much being felt in Seattle as it was across all of the USA. The Great Depression had started with the New York stock market crash in October 1929, with many contributing factors such as the over-extension of credit and the lack of “safety net” programs for people who lost their jobs. The year 1933 was an inauspicious time for young couples to marry as the financial outlook was not very hopeful. People were afraid of the insecurity in the economy and the jobs outlook, but with his characteristic optimism Albert Balch was confident of better days ahead. In the midst of “down” economic times, Balch never lost his interest in “building a city.” In the depths of the national and local economic depression in 1935, Balch and his business partner, Ralph Jones, made the decision to change careers. They started with $25 and a risky investment in unimproved land in northeast Seattle. To be continued in Part Two: Albert Balch struggled to get established in a career during the economic depression years of the 1930s. Beverly, Massachusetts was named by the General Court in 1668 for the minstertown of Beverley, England (Beverley was a Yorkshire church town in England). The name “Beverly” was not universally popular. In 1671, founder Roger Conant and 71 residents petitioned both the Great and General Court to change the name to Budleigh but it did not go through. “Albert Balch.” Washington: Northwest Frontier, Family and Personal History, Volume 3, page 15-16, 1957. Seattle Public Library 979.7 St49W. Albert Balch notes compiled by Ethel V. Madigan, Secretary-Treasurer, Wedgwood Corporation, 1978; Ethel Madigan interview notes 2004. “Talent as Salesman Made Seattle Builder Leader in Industry.” Seattle Daily Times, November 15, 1953, page 161. This entry was posted in Balch and tagged Balch family history, Neighborhood History, real estate developer in Wedgwood, Seattle, the founder of the Wedgwood neighborhood, Who created the Wedgwood neighborhood, WPLongform. Bookmark the permalink.